Oliver! – Did You See That One? From the workhouse to the street, Oliver (Lester) is seeking a place to call home. Along the way he finds himself among a group of thieves led by Bill Sikes (Reed). This film won Best Picture in 1968, beating out films like The Lion in Winter and Funny Girl. The story is based on Charles Dickens’ (Great Expectations) classic novel “Oliver Twist”. This story was developed into a stage play by Lionel Bart (Lock Up Your Daughters!). Vernon Harris (The Good Die Young) took Bart’s work and wrote the screenplay for this film version. Carol Reed (The Third Man) directed the film, earning an Oscar win for Best Director. The film stars Ron Moody (Murder Most Foul), Shani Wallis (A King in New York), Jack Wild (Our Mutual Friend), and Oliver Reed (Gladiator). The title role was played by Mark Lester (Our Mother’s House). This is a classic story that was given a musical treatment thanks to the work originally done by Lionel Bart. The dialogue is a mix of singing and speech that leans towards a more classic approach to musicals. Critics like Pauline Kael considered this version of the story to succeed far better than the stage version. The film does have some darker themes that come out in the second act of the story. The story is mainly told through song, so this might not work for everyone. Unlike The Wizard of Oz or The Sound of Music, this one doesn’t quite find the balance with the music and spoken dialogue. Still, this is a classic musical with a number of memorable moments. Vernon Harris was nominated for an Academy Award for Best Adapted Screenplay for his work on this film. The biggest issue with this film also comes from the writing. The pace of the film gives way to a huge number of musical moments that slow things down far too much. While this isn’t a problem for fans of musicals, it might be an issue for some viewers. The writing can’t really be discussed without talking about the music of Lionel Bart. His contributions to the film account for all of the songs. Composer Johnny Green (West Side Story) worked to arrange the music to fit the film, earning an Oscar for Best Score of a Musical. (It was also revealed in 1988 that Green’s daughter Kathe had sung the parts for Mark Lester in the film.) The songs are a mix of high energy numbers and sentimental ballads. The performances bring the unique elements of the characters into the songs, adding some nice moments in the movie. The performances of the many cast members in this movie are pretty impressive. Ron Moody, Jack Wild, Shani Wallis, and Oliver Reed all do excellent work with the many demands of the script. 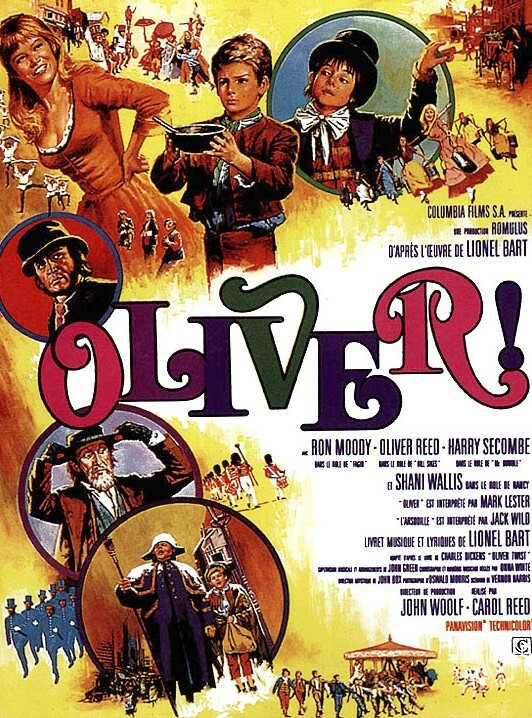 Ron Moody and Jack Wild would earn Oscar nominations for their roles in this film. (Moody for Best Leading Actor, Wild for Best Supporting Actor) Wallis also does an excellent job with her somewhat complicated role in the film. Mark Lester also does nice work playing the innocent young Oliver. While he didn’t do any of the singing, his acting helps to make him a great central figure in the story. The ability to sing, act, and dance all come together in just the right ways. As with most movies like this, the acting isn’t the highest priority. The success of the cast comes from the musical aspects of their roles. In addition to the stars, the many other players all do nice work. The production of this movie combines great audio and visual work. In addition to the wins already mentioned, this one went on to win Best Sound and Best Set Decoration. Additionally, this one was nominated for Best Film Editing, Best Costume Design, and Best Cinematography. The work done by Onna White stands out thanks to her great skill in choreographing the large-scale musical numbers throughout the film. The movie also features visuals that really bring the unique world of the story to life perfectly. While there are moments where the stage roots of this story seem to come out, this one generally lives within the bigger world of the film. This film won a total of five Oscars in competitive categories as well as a Special Award for Onna White’s choreography work in the film. These wins came from a total of eleven nominations. With a run time of 153 minutes, this one isn’t for everyone. As mentioned above, the pace is slow and deliberate. While this works to add in musical numbers, it can drag at times. The other issue is that the songs in this film haven’t quite become the timeless classics that casual viewers are familiar with. Still, fans of classic musicals will definitely enjoy this one. I would also suggest this to anyone who loves Dickens’ classic story of “Oliver Twist”. I give this one 3.2 out of 5 stars.